If you’ve ever cut a sick figure on the d-floor of a nightclub or thrown shapes to some EDM bangers, you probably don’t know it, but you’ve probably got two dudes from the UK called Amorphous Androgynous to thank for it. Although preferring to keep an underground presence for most of their 20-plus-year career, Garry Cobain and Brian Dougans are responsible for shaping the very sounds of dance music. The pair, alternately known as The Future Sound Of London, are prolific producers who’ve not only worked with some of the biggest names in dance but have also been in the studio with some of the rock world’s big names. The guys recently turned their eyes down under with A Monstrous Psychedelic Bubble (Exploding In Your Mind) – The Wizards of Oz, a collection of Australian and New Zealand born tracks which traces the lineage of psychedelic sounds from the ’60s to today. Ahead of its Record Store Day vinyl release on 18th April, Gaz Cobain has shared with us six of his favourite stories about working with some of the music industry’s biggest names. This man is a true inspiration and a true original – a pioneer. We sent him our album The Isness in 2001 and suddenly there he was on the phone with stories of the mantra and the drone and Celtic music fusing together via Atlantis and Transcendental meditation. At first I thought it was a prank call but it quickly transpired that it could only be Donovan! I had the honour of speaking about Donovan in the great film about his life, Sunshine Superman, plus we recorded a version of one of my tracks with him singing Divinity, which is as yet unreleased. The fact he had the humility to record one of my songs still blows my mind in light of this man’s vast legacy and talent, but kind of makes me sad in hindsight because I really am NOT worthy and should have insisted we devote ourselves to his songs or at least remixed some of his master tapes! Gary Lucas, he of the legendary Captain Beefheart Band of the ’70s, and who became Don Vliet’s art manager when he moved into art in the ’80s, and then worked with and co-wrote Mojo Pin and Grace with Jeff Buckley. This guy is my favourite studio guitarist, since he has a million and one ideas and sounds and is always willing to experiment with his skills. We have played many an incendiary gig with this guy too, on many a continent. He is always an incredible raconteur, and I have spent tens of hours asking him questions and hearing stories of Buckley, Beefhart and his own wisdom. The Amorphous truly do hail Gary Lucas! I met Ian at a pivotal phase in my life. We were very successful at the time as the Future Sound Of London, and had just finished our third album Dead Cities. But my interests were changing to a new psychedelic vision, which later became the Amorphous Androgynous. Ian was instrumental in an early template for this new psychedelia and I stayed with him in LA for a month, burning sage and meditating and growing into a spiritual life, looking beyond alcohol, in which we had both been overindulging. We wrote a couple of tunes together and we used to drive around LA, him flicking between a hundred and one myriad personalities and characters: a genius, a sage man and everything in between. My own need to communicate necessitated me writing and singing. I was never a singer of the quality of these guys but somehow it felt like I had to try, to learn, to grow, to heal, and that somehow my innocence and naivety (and absurdism) fitted my music more, so I continued on my own path. Ultimately this has given me a more complete understanding of and ability to produce songwriters. 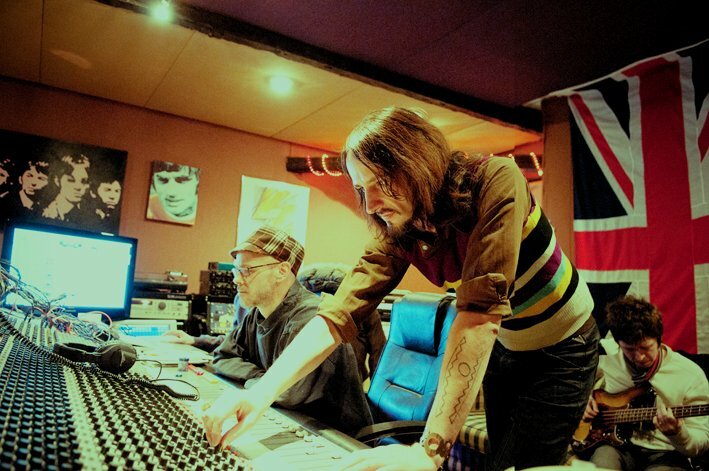 We spent two years working on what was supposed to be the solo album with Noel. I could — and probably will — write a book about those two years. The sheer scale of the creative process we embarked on, coupled with the covert goings-on which ultimately led to its destiny as a “lost album” are mind-blowing to this day, but at least makes for a truly great rock ‘n’ roll story. He still fascinates me. He’s a great untapped source. The only thing holding him back is himself. He constantly talks about how he’s “long accepted his limitations” but I don’t really believe that. Go and listen to The Right Stuff and Shoot a Hole Into The Sun, both co-written and produced with us. Although it’s not the best material we worked on together, in my opinion, they prove quite clearly that when he lets his hair down he can write in a completely different way. If he placed more faith and trust in himself, Noel could reap magic. I never had any doubt, simply because he’s a lot more talented than I, and I’ve never stopped having fun and exploring my own limited talents. At the end of the day, I always want people to be the best possible version of themselves and try and encourage that expansion. I don’t think he needs any introduction as the singer in The Jam and The Style Council, does he? We wrote seven tracks with him a couple of years ago and the guy is a musical whirlwind, which is definitely our kind of collaboration. Jumping from instrument to instrument, laying down a maelstrom of ideas, formulating lyrics on the spot. We’re still grappling with the scale of what we did during those sessions. One co-written track White Sky kicks off Paul’s new album Saturn’s Pattern, but there’s a couple of other mind-blowing tracks that we have huge love and dedication for. We can’t wait to one day finalize these with him. A revered Indian classical musician with whom I travelled around India, and who has expanded the sonic universe of the Amorphous Androgynous with sitar/dilruba/tablas and even penny whistle. Another musician who, despite a lifetime of learning and discipline, is still open-hearted and ope-minded enough to adapt his great skills to my innocent, absurdist songwriting. We’re indebted to him. He plays sitar and the intro penny whistle and tablas on The Isness‘ Divinity (below). ‘A Monstrous Psychedelic Bubble (Exploding In Your Mind) – The Wizards of Oz’ is available now on CD and Digital with an exclusive Record Store Day double vinyl edition out 18th April.